Almost every song that Shamshad Begum, with her distinctive voice, sang as a solo or in a duet or as the lead singer in a qawwali was a hit, from 'Milte Hi Aankhen Dil Hua Deewana Kisika' to the ever popular 'Kajra Mohabbatwala'. 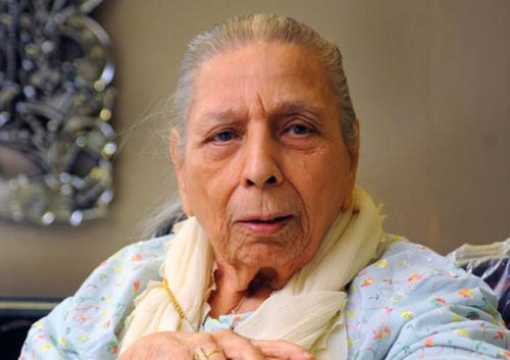 Today (14 April 2019) marks the birth centenary of one of India’s most durable and outstanding singing voices — Shamshad Begum. The legend was born the day after the horrific Jallianwala Bagh massacre in Amritsar. Shamshad, of course, was born in Lahore, the capital of undivided Punjab. A documentary on this great musical talent, by Rajeev Srivastav, was screened recently in Delhi for an invited audience. The surprise is that it took so long for someone to decide to make a documentary on this thoroughly versatile and talented singer whose magical voice resounds across generations through her immortal numbers. The film has been aptly titled Dharti Ko Akash Pukare after one of her famous songs from the film Mela (1948). Shamshad came from a Muslim family. Her father was a mechanic. Her parents had eight children and the ambience at home was a conservative one. But Shamshad Begum was a movie buff and a devoted fan of the great singing star of the 1930s and 1940s, Kundanlal Saigal. She herself confessed once that she had watched New Theatres' Devdas (1935, Hindi) 14 times just to be able to hear Saigal's songs in the film and try to imbibe something of his mellifluous voice. The song she was specially enchanted by was the immortal number, 'Balam Aaye Baso More Man Mein'. Her daughter Usha Ratra said it was the principal of the school where Shamshad Begum studied who discovered the young girl’s magical voice and talent in music. But in those days, girls from respectable families taking to singing and that too in the public domain was looked down upon because female singing was immediately linked to the music practised by courtesans. Shamshad Begum’s grandmother was very conservative and would not hear of the granddaughter taking up music. But she had an uncle who encouraged her. “His name was Aamir Khan. He was fond of music and encouraged her to sing during Muharram. She would earn one paisa that should equal Rs50 today,” said Ratra. Mentored by sarangi maestro Ustad Hussain Bakshwale Saheb and composer Master Ghulam Haider, Shamshad Begum made her debut on the Lahore station of All India Radio in 1937. During the late 1930s, Shamshad sang for AIR both in Peshawar and in Lahore, bringing her voice to the notice of music directors. She later sang Hindi and Punjabi songs for AIR Delhi as well, as part of the Crown Imperial Theatrical Company of Performing Arts. Ghulam Haider was the one who gave her a break in Hindi cinema. So impressed was he, according to one account, when Shamshad sang Bahadur Shah Zafar’s ghazal 'Mera Yaar Mujhe Mile Agar' at an audition that he gave her a contract for 12 songs and Rs2 as tonga fare. Her big milestone came when Shamshad Begum was invited to come to Bombay and even act in films, but her conservative father warned that if she appeared on screen, he would put a stop to her singing forever. On Shamshad's eventual move to Bombay, one story goes that the great filmmaker Mehboob Khan approached her father and offered to take her to the city, give her a flat, a car and attendants, and escorts to accompany her for which he would meet the expenses. Her father was adamant; her grandfather did not want her to go. But they gave in after seeing her eagerness to go, and Shamshad Begum’s life in music changed forever. Another story goes that her playback career began with Master Ghulam Haider in Khazanchi (1941) and Khandaan (1942) and when Ghulam Haider moved from Lahore to Bombay, she moved with him as part of his team, adding to a gifted list of female playback singers in Bombay such as Rajkumari and Amirbai Karnataki. Every song Shamshad sang, as a solo or in a duet or as the lead singer in a qawwali, was a thumping hit. Consider the famous qawwali in K Asif’s magnum opus Mughal-e-Azam (1960), a duet with Lata Mangeshkar, 'Teri Mehfil Mein Kismet Aazmakar Hum Bhi Dekhenge'. Or 'Milte Hi Aankhen Dil Hua Deewana Kisika', sung with Talat Mehmood for Babul (1950) and picturized on Dilip Kumar and Munawar Sultana. A similar and equally beautiful song she sang for Mehboob Khan’s Mother India (1957) is 'Peeke Ghar Aaj Pyari Dulhaniya Chali' and that hit duet with Mohammad Rafi, which went, 'O Gaadiwale Gaadi Dheerey Haank Re'. There is a back story to her songs in Mother India. After Shamshad Begum’s husband Ganpat Lal Batto had passed away in 1955 in a road accident, she went into seclusion and stopped singing or even meeting people because she could not get over her grief. Then Mehboob Khan, who had already kept her in mind for some of the numbers in Mother India, visited her and persuaded her, almost commanded Shamshad, to come out of her seclusion. His logic was that she was keeping her entire family in grief and he needed her to come and sing for him. That marked the second coming of Shamshad Begum and what wonderful numbers she gave us in the film, including the Holi song 'Holi Ayee Re Kanhayee'. The love story of Shamshad Begum and Ganpat Lal Batto could easily become a film script. In 1932, the teenage Shamshad met Ganpat Lal, a Hindu law student who lived in the neighbourhood and was several years older. In those days, marriages were routinely performed while the bride and groom were very young, and Shamshad's parents were already looking for a groom for her. But soon, in 1934, despite tremendous opposition from both families owing to religious differences, the 15-year-old Shamshad got married to Ganpat Lal Batto. The couple were blessed with a single child, a daughter named Usha, who in due course married a Hindu. Shamshad sang about 1,650 songs in Hindi, Urdu, Punjabi, Bhojpuri, Rajasthani, Tamil and other regional languages during her career starting with 'Kankaa Diya Faslaa Pakiya' in the Punjabi film Yamla Jat (1940). Her maiden Hindi film was Khazanchi (1941) under Ghulam Haider's baton, in which she sang 'Saawan Ke Nazaarein Hain'. Her first film in Bombay was Taqdeer (1943) for which she was invited to sing for Nargis by Mehboob Khan. She also sang for Aag (1948), Raj Kapoor's first film as producer-director. For his Awara (1951), Shamshad Begum sang the seductive number 'Ek Do Teen, Aaja Mausam Hai Rangeen'. Another source puts the number of songs Shamshad sang over her career at more than 6,000 songs in Hindi, Bengali, Marathi, Gujarati, Tamil and Punjabi, of which 1,287 were Hindi film songs. Irrespective of what the total number might be, Shamshad Begum has left behind some wonderful songs, particularly in films by Guru Dutt. It would be in context here to point out that the credit for drawing out the talent hidden in her to deliver quick, racy songs with naughty beats lies squarely on the shoulders of OP Nayyar. Under OP Nayyar's baton, she sang 'Leke Pehla Pehla Pyar' for Guru Dutt’s CID (1956), sung with both Mohammed Rafi and Asha Bhosle, 'Boojh Mera Kya Naam Re' and the absolutely delightful 'Kahin Pe Nigahein, Kahin Pe Nishana'. The song 'Thandi Hawa Kali Ghata' sung by her and Geeta Dutt for Guru Dutt’s Mr and Mrs 55 (1955) is also a beautiful melody. And no one who has heard the song will ever be able to forget the liltingly romantic 'Meri Neendo Mein Tum Mere Khwabon Mein Tum', sung as a duet with a very young Kishore Kumar and picturized on Kishore Kumar and Meena Kumari in Naya Andaz (1956). But as Nayyar got closer personally to Asha Bhosle, Shamshad Begum began to feel marginalized, with the composer concentrating on exploring and developing Bhosle's singing talents. Never one to push herself in any way, Shamshad knew when, how and why to melt into the background, gracefully and with great dignity. OP Nayyar did rope Shamshad Begum in once again years later, in 1968, to sing the magnificent 'Kajra Mohabbatwala' for Manmohan Desai's Kismat with Asha. The film was no great shakes, but the song was a runaway hit and is remembered even today. 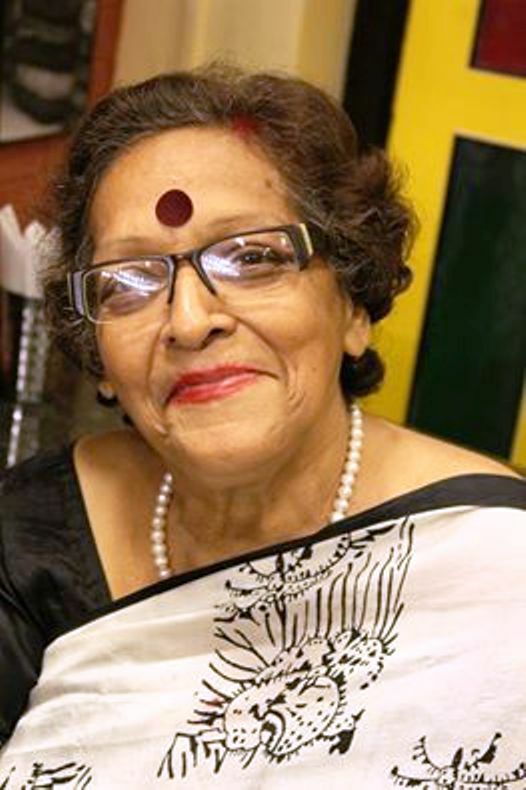 Shamshad had no issues with her songs being remixed in new versions in contemporary times and would smile and say let the youngsters have fun, what is the problem? Forever media-shy, she hardly made public appearances or gave interviews. She never bad-mouthed anyone from the industry at any time and retained her dignity by withdrawing quietly without creating a single discordant note. When she began feeling that politics within the music industry was making its presence felt, she just stopped singing for films. All she would say in her last interview to Filmfare magazine in 2011 was that there was too much of a stench around. For the same reason, she stubbornly stopped her daughter from stepping into the music world because she could sense the politics that dominated the world of film music and did not want her to fall victim to this. 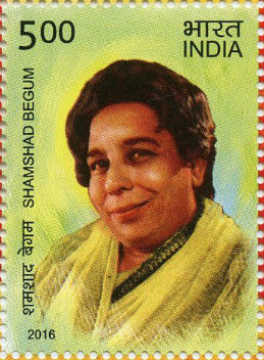 In August 2008, a great fan of Shamshad Begum published a book on her concentrating mainly on her musical world. The name of the book was Khanakti Awaaz... Shamshad Begum. The fan was Chandrakant Mohanlal, a retired professor of mathematics. Mohanlal spent seven long years researching the book and wrote many letters to the Union ministry of Information and broadcasting to give national recognition to Shamshad Begum for her rich contribution to Indian music of every kind. Shamshad was eventually conferred the Padma Bhushan in 2009 at the age of 90! Mohanlal's book is filled with rare photographs, including stills of films like Humayun (1945), CID and Al Hilal (1958), from his personal archive. He interviewed music directors like Naushad, OP Nayyar and Ravi who vouched for Shamshad’s brilliance. The book also features the entire database of 1,600 songs sung by Shamshad, making the 350-page book a collector’s item. “I have all the records of her songs, some of which I picked up from the bylanes of Chor Bazar in Mumbai,” the author had said at the time. Mohanlal had even travelled to Pakistan for research on the singer whose reclusive nature kept the media away from knowing more about her than her songs. The book chronicles her life and songs and is also studded with photographs. The musical section contains statistics and break-up data about her songs in different languages and genres as well as with different music directors and singers and for different actresses. Indian music in general and film music in particular lost one of its most versatile singers, whose style, voice, and manner of rendition set new benchmarks for vocal music of every kind when she passed away at the ripe old age of 94, on 23 April 2013.